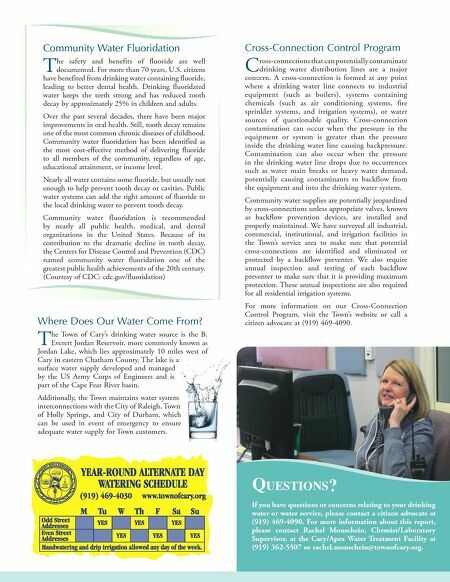 Community Participation T he Town of Cary is committed to being open, transparent, and accessible and encourages public input in decisions affecting our community's drinking water. Regular meetings of the Cary Town Council are typically held on the second and fourth Thursday of each month at 6:30 p.m. in the Council Chambers at Town Hall located at 316 N. Academy Street in Cary. The public is welcome. 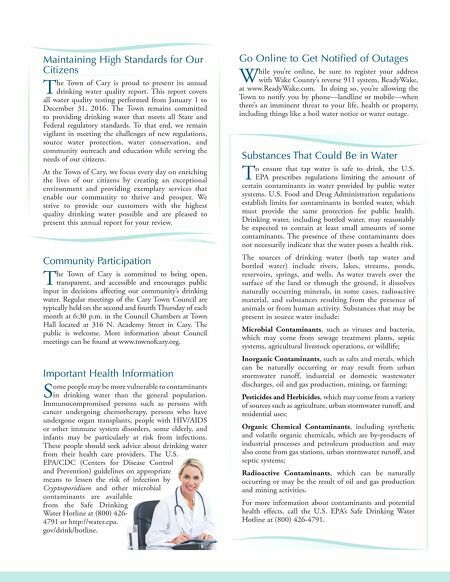 More information about Council meetings can be found at www.townofcary.org. Important Health Information S ome people may be more vulnerable to contaminants in drinking water than the general population. Immunocompromised persons such as persons with cancer undergoing chemotherapy, persons who have undergone organ transplants, people with HIV/AIDS or other immune system disorders, some elderly, and infants may be particularly at risk from infections. These people should seek advice about drinking water from their health care providers. The U.S. EPA/CDC (Centers for Disease Control and Prevention) guidelines on appropriate means to lessen the risk of infection by Cryptosporidium and other microbial contaminants are available from the Safe Drinking Water Hotline at (800) 426- 4791 or http://water.epa. gov/drink/hotline. Maintaining High Standards for Our Citizens T he Town of Cary is proud to present its annual drinking water quality report. This report covers all water quality testing performed from January 1 to December 31, 2016. The Town remains committed to providing drinking water that meets all State and Federal regulatory standards. To that end, we remain vigilant in meeting the challenges of new regulations, source water protection, water conservation, and community outreach and education while serving the needs of our citizens. At the Town of Cary, we focus every day on enriching the lives of our citizens by creating an exceptional environment and providing exemplary services that enable our community to thrive and prosper. We strive to provide our customers with the highest quality drinking water possible and are pleased to present this annual report for your review. Substances That Could Be in Water T o ensure that tap water is safe to drink, the U.S. EPA prescribes regulations limiting the amount of certain contaminants in water provided by public water systems. U.S. Food and Drug Administration regulations establish limits for contaminants in bottled water, which must provide the same protection for public health. Drinking water, including bottled water, may reasonably be expected to contain at least small amounts of some contaminants. The presence of these contaminants does not necessarily indicate that the water poses a health risk. The sources of drinking water (both tap water and bottled water) include rivers, lakes, streams, ponds, reservoirs, springs, and wells. As water travels over the surface of the land or through the ground, it dissolves naturally occurring minerals, in some cases, radioactive material, and substances resulting from the presence of animals or from human activity. Substances that may be present in source water include: Microbial Contaminants, such as viruses and bacteria, which may come from sewage treatment plants, septic systems, agricultural livestock operations, or wildlife; Inorganic Contaminants, such as salts and metals, which can be naturally occurring or may result from urban stormwater runoff, industrial or domestic wastewater discharges, oil and gas production, mining, or farming; Pesticides and Herbicides, which may come from a variety of sources such as agriculture, urban stormwater runoff, and residential uses; Organic Chemical Contaminants, including synthetic and volatile organic chemicals, which are by-products of industrial processes and petroleum production and may also come from gas stations, urban stormwater runoff, and septic systems; Radioactive Contaminants, which can be naturally occurring or may be the result of oil and gas production and mining activities. For more information about contaminants and potential health effects, call the U.S. EPA's Safe Drinking Water Hotline at (800) 426-4791. Go Online to Get Notified of Outages W hile you're online, be sure to register your address with Wake County's reverse 911 system, ReadyWake, at www.ReadyWake.com. In doing so, you're allowing the Town to notify you by phone—landline or mobile—when there's an imminent threat to your life, health or property, including things like a boil water notice or water outage.